When I was a kid, I'd pick up the stray pennies, nickels, dimes, and quarters on the sidewalk. Others overlooked these coins, considering them to be petty. But to me, they were worth something. I'd put them in my pocket and say "Every little bit helps! Now I'm 5¢ closer to retirement." I'm still picking up these coins, and I'm still acknowledging that they are helping to inch me closer to retirement. Nowadays, I chuckle as I ponder how fortunate I am to have started my retirement in my mid-30s. Admittedly, scanning the sidewalk for dropped coins isn't going to get me too far. On the other hand, scanning the Departments of Revenue websites to see if I have any unclaimed property may get me a bit farther. "Unclaimed property" refers to property that is being held for a person (or entity) who cannot be located. This property may be a refund of a utility deposit, insurance proceeds, or safe deposit box contents, for example. The utility company, insurance company, or bank that is holding onto the property is required to turn the property over to the state, typically after three years. The state's Department of Revenue then serves as the custodian of the property. Each state's Department of Revenue administers a program whereby it assists in matching the unclaimed property to its rightful owner. Most Departments of Revenue offer a website where one can search by an individual or business name to locate unclaimed property. If an owner is found, the owner files a claim, the state confirms the owner's identity, and then the state returns the property to its rightful owner. 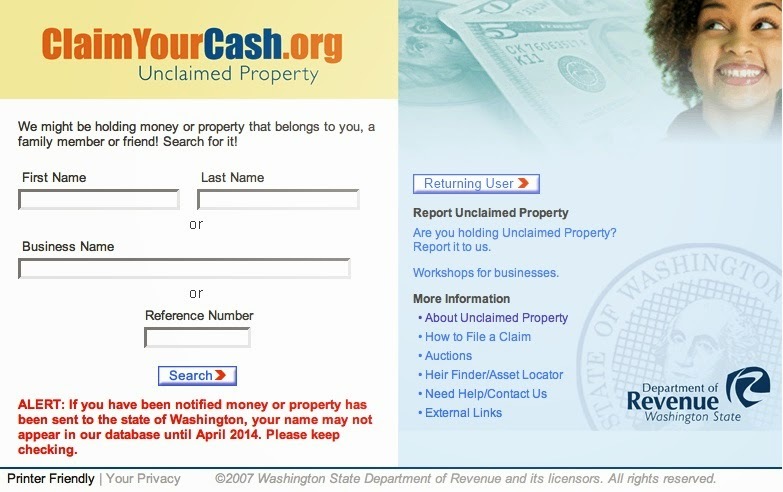 Washington state's unclaimed property website. I'll occasionally visit the Department of Revenue websites for every state where I've lived and do a quick search to see if I have any unclaimed property. Today's search revealed that I have unclaimed property from an Illinois utility company. The utility company had attempted to mail me a refund check a few years ago, but the check never made it into my hands. I filled out the brief claim form on the Department of Revenue's website. And voila! My unclaimed property is now claimed. It's nearly as easy as finding petty coins on the sidewalk! Every little bit helps! Now I'm many-nickels-worth closer to retirement. Didja Know About General Delivery?